The house that we bought two years ago has a lovely backyard. Most notably, it has a number of trees that provide shade and protection from the wind. As well, many species of birds live in our trees, or in those of our neighbours to the west. Our trees include a large spruce tree, a cedar tree, an elm tree, a couple of decorative flowering trees, and an ancient crabapple tree that has gone wild. Clearly, the former owners had the backyard professionally landscaped. The sunny centre of the yard is taken up with a large patio, fire pit, and a narrow strip of grass. In the summer, we often barbecue out there, and then in the evening build a bonfire and sit around it looking into the flames. Along the back and side fence, and behind one side of the house are raised beds, planted with shrubs and shade and drought-tolerant perennial plants. It is a beautiful yard and I really like it. 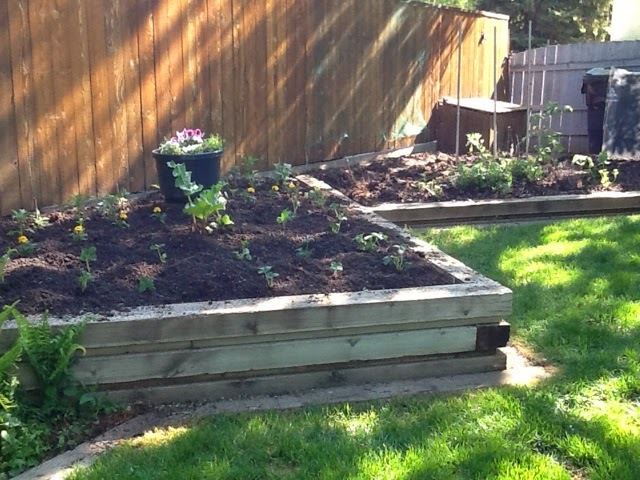 However, I found one thing lacking: a spot for a vegetable garden. Because of all the trees and also because the backyard is on the north side of the house, much of the yard is quite shady. Also, I did not want to disturb the aesthetics of the landscaping or the functionality of the patio. However, I very much wanted a vegetable garden. The first summer, I planted a few vegetables in amongst the shrubs in one of the sunniest raised beds. They did not thrive. I harvested almost nothing. I analyzed the problems as too shady; poor soil; and that the shrubs sucked up all the water. The second summer, I dug up the shrubs in that bed and moved them to the front yard. Rob pruned a nearby tree so that it did not shade the bed quite so much. I added compost and steer manure to the heavy clay soil. The bed was fully devoted to vegetables. Once again, it was not a very successful garden. The tomatoes, Japanese eggplants, carrots, and herbs grew well, but not much else. Part of the problem was the poor soil. Another problem was that we went travelling for a month, leaving the garden to be watered by someone else. I seem to do this every summer -- put in efforts planting a garden, then leave for main part of the summer. Also, last summer, Rob built three tall narrow planters out of pipe that we put along the edge of the patio. We planted them with strawberries which seemed to thrive. Even though it was their first year, they bore an autumn crop of berries. Unfortunately, the plants did not survive the cold winter. In the pipes, their roots were too exposed. Since we have moved here, I have wanted to put in some raspberry canes and some rhubarb. Also, we needed to find a place for strawberries. So I have taken over another one of the raised beds. Rob cut down the decorative tree that took up most of the bed. Although it was a pretty tree, it had invasive roots that prevented anything else from growing in that bed. It shaded the vegetable garden more than I liked. Also, at some point in the past, it had been pruned badly with the main lead cut away. It had a double trunk and put up many suckers. It also attracted tent caterpillars and ants. So although I was sad to see the tree go, I now have another little food garden. This photo shows the new bed, and in the background, my vegetable patch. I planted most of the new garden yesterday. The strawberries are at the front, the rhubarb in the middle, and the raspberries along the fence. I have planted a container of annual flowers, and put it on the stump.